The Discus Thrower (1926) by Costas Dimitriadis. Located in Randall’s Island, New York. Bronze. Restored in 1999. 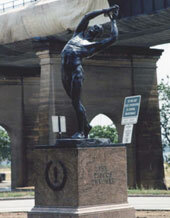 The Discus Thrower monument, suffered vandalism that included, but not limited to, the removal and theft of the proper left arm and discus. Using historical photographs and other available relevant documentation, modeling of the missing elements began. 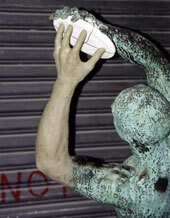 A qualified sculptor modeled clay directly on to the existing bronze sculpture. 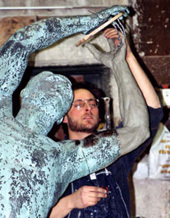 The arm was attached to the original sculpture by standard foundry practices. A new patina was applied to the remodeled sections. 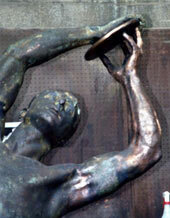 The bronze and patina were protected with an application of sculpture paste wax.